Have you ever been stymied by the 150-character limit in your Instagram bio? How about the inability to add more than one link in that bio? Well, Instagram has apparently heard the grumbling. What do these updates mean for brands? With hashtag and profile links in your bio, you can lead people to your content right from your profile. 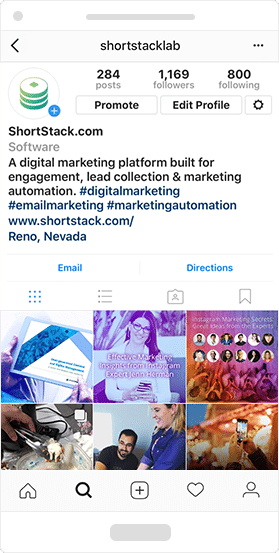 Whether you’re a brand trying to capitalize on a hashtag like #SFfoodie or #beautygurus, or you run an #Irishbar, or you have multiple accounts you want to link to from your main account, using hashtags and adding additional accounts gives your page a little more exposure. To add a hashtag or profile link in your bio, just tap on Edit Profile and go to the bio section. When you type a # or @, you will see a list of recommended hashtags and accounts in the typeahead. Once you select the hashtags and accounts you want, they will automatically be linked in your bio. In our bio, we elected to add hashtags that are relevant to our business, as you can see below. By the way, if you choose to mention someone else’s profile in your bio, they will receive a notification and they can choose to remove the link to their profile. Their profile will remain in your bio but without a link. Over the last year or so, we’ve heard an increased number of complaints about how Instagram changed its algorithm so posts no longer appeared in chronological order. The change actually happened in 2016, and people have been complaining ever since. Brands, especially, have noticed a drop in engagement. Now, presumably in response to user feedback, Instagram announced last week that it was giving users more control over what appears in their feeds. Instagram is testing a “New Posts” button that allows users to choose when they want their feed to refresh, rather than it happening automatically. In other words, newer posts are more likely to appear first in your feed. Notice I said “more likely?” The change doesn’t mean that the feed is strictly chronological again, but it does mean that old content should not surface again and again in your feed. New content has priority. Remember there are a number of factors that Instagram takes into account, including engagement, and the length of time people spend viewing particular posts. For businesses, this means you’ll want to pay more attention to when your audience is most active so you can post at the “right” times. You might also need to post more often since posts won’t have the lifespan they’ve had.